During 2014, I significantly pared my position in the stock CEF Adams Express. I sold my highest cost shares including a number of shares purchased with dividends. The overall position went from over 900 shares to 467+ with a current average cost per share of $9.75. A snapshot of the current position can be found in this post: Item # 4 Pared ADX Again-Sold 143 Shares at $13.97 (8/9/14 Post) I realized a $786.65 profit selling those ADX shares. The total return would be much higher given the dividends paid by this CEF which I was reinvesting prior to 2014. And those reinvested dividends produced more dividends that were reinvested and later sold for profits. Most of the year end distribution consisted of long term capital gains. I subscribe to the free service ePropertyWatch that keeps me apprised of developments in my neighborhood, including nearby home sales and foreclosures. The information is generated by the firm CoreLogic which probably has the largest nationwide database of real estate information. This firm will constantly update the value of my home, based on its square footage compared to the price per square foot of nearby sales. That will not be a precise estimate given the differences inside each of those homes and their respective conditions. Nonetheless, I have a good idea of how my home's price was impacted by the housing bubble and how fast the price recovered from the 2008-2009 downdraft. I knew that the roughly 10% compounded price increase from 2002-2006 was unsustainable and that knowledge actually contributed to my decision to pare my stock allocation in 2007. The historical rate of growth was near 4% (1% real; 3% inflation). I also knew that many geographic areas were experiencing 20% compounded growth rates even though median real incomes were stagnant. 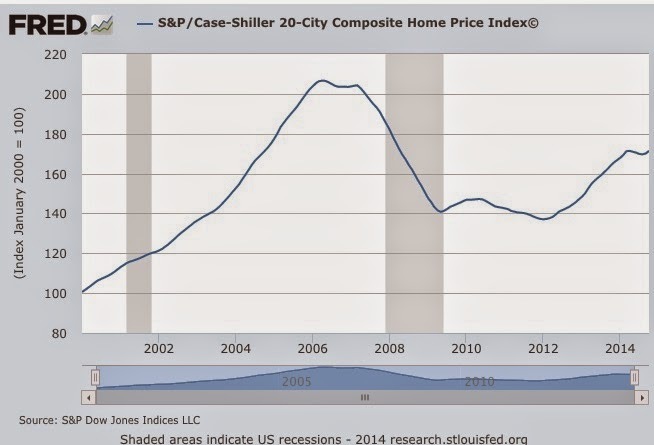 It only takes a modest amount of common sense to put those two factors together, a parabolic increase in home prices and stagnant real wage growth, and to reach the only conclusion possible. Frequently, it pays not to think too much. Since I live in a robust economic area (the Nashville metropolitan area), my home price has now returned to well above the prior peak reached late in 2006. Basically, trend line 4% growth has been restored by eliminating the excess from 2002-2006. Several metropolitan areas that experienced parabolic price increases will take several more years to reach their respective 2006 peak levels, while others are slow to recover due to economic factors unique to their areas. Rationale: I waited until I had a long term capital gain to harvest the profit. I believe that the merger between RFMD and TriQuint Semiconductor will occur on 12/31/14. If my memory is correct, which is an assumption that I no longer will make, I would have received 50 shares in the new entity formed by that merger called Qorvo, and then there would be a 1 for 10 reverse stock split, leaving me with 5 Oorvo shares. Given that my gain was over of 200+% in one year + one day, I did not see any reason to go through that process, and I have no opinion on the fair value of the new entity. Needham did downgrade RFMD and TriQuint on 12/29, since both stocks had exceeded the analyst's price targets, Seeking Alpha, but that had no bearing on my decision to sell my 50 share RFMD position. 2. Added 50 CHN at $17.79 (see Disclaimer): The China Fund (CHN) is a closed end stock fund that invests in companies with significant assets, production, trading or other business interests in China. Morningstar currently has a 4 star rating on the China Fund (CHN). As of 12/26/14, Morningstar calculated the annualized 15 year total return at 16.23%. I recently sold an 80 share lot at $22.34 after figuring out that the China Fund was going to have its 4th consecutive $3 per share or higher year end distribution. I mentioned in that post that I would add those shares back after the ex dividend date. That only looks like a loss. My total return is decent given the dividends paid by this fund since my original purchase in 2011. 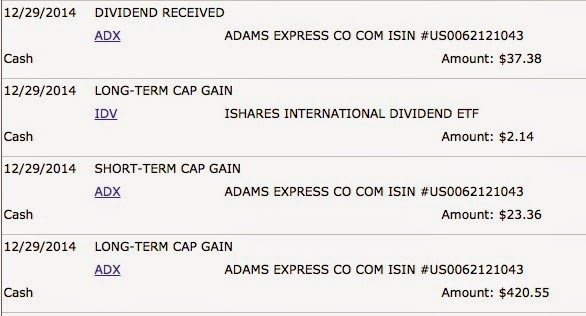 Dividends: I am reinvesting the dividends paid since I first acquired shares in 2011. The last distribution was $3.7651 per share and has already gone ex dividend. The China Fund, Inc. Confirms Distribution Of that amount, CHN classified $3.4669 per share as a long term capital gain distribution. I will receive the shares purchased with that dividend on 1/5/15. This fund is not what anyone would call tax efficient. Fund Description and Performance History: This fund will own securities traded in Taiwan, Hong Kong and Shanghai, as detailed in the following snapshot. The China Fund does not own shares in Chinese stocks like Baidu. I do not know whether the fund has a stake now in Alibaba. The fund did report a position in Tencent (TCEHY) as of 7/31/14. This fund has a value oriented style. I noted when I last bought shares that the fund managers are aggressive, Item # 5, and there is a frequent turnover in the top ten positions. That is not surprising given the huge long term capital gains realized by this fund over the last several years. If I had known in 2011 what I know now about the capital gain distributions, I would have bought shares in the Roth IRA back then. As expected, the P/E ratio at 12.78 is low compared to the U.S. stock indexes. The Shanghai Composite has been rallying this year, but is still well below its peak hit back in 2007. SS Interactive Chart The SSE composite started 2014 near 2115 and is now close to 3,165. There was a parabola spike, starting around October 2006 at 1,838, that peaked in October 2007 near 6,000. The index then cratered to slightly below where it had started that parabola in October 2006. Parabolas have a tendency to collapse onto themselves, taking back most or all of the gains during the spike. This fund also has exposure to stocks traded on the Hong Kong exchange. HSI Interactive Chart The Hang Sang index has had a subdued 2014, rising from about 23,306 to around 23,501. Rationale and Risks: China has its problems that are generally well known. Growth is slowing. Growth after the Near Depression was financed in large part by massive increases in debt that funded large construction projects that were a serious misallocation of capital. I am referring to the ghost cities, bridges to nowhere, shopping centers with no stores, etc. Manufacturing has been hurt, as shown in the recent PMI numbers published by Markit due in large part to the economic slowdowns in Europe and other areas. The Markit press releases for all geographic regions can be found at Markit Economics-Press releases. The P/E ratios for the stocks owned by CHN are far lower than U.S. stock market indexes, and the Hong Kong, Taiwan and Shanghai stock markets have not experienced anywhere near the move generated by the S & P 500 since March 2009. So, there is more long term value in those markets than in U.S. stocks at their current valuations. There is however considerable country risk. I view that risk as far less than in places like Russia or Venezuela, but the country risk is still significant and noteworthy. Overall and for the long term, I want to have some participation in China's stock market. Those companies will become some of the largest in the world. GDP growth will be better than the western democracies. There simply needs to be a transition to more of a consumer led economy from one emphasizing exports and government misallocations of capital for unnecessary internal projects. Future Buys/Sells: I am in a trading mode for this security. I consequently will consider selling my highest cost shares when and if I can do so profitably. The dividend adjustments to net asset value per share make that a difficult task given their size. I may continue to average down with 50 share lots when the discount to net asset value per share is greater than the 3 and 5 year averages which was the case for this last purchase. I will not average down when and if I see another large capital gain distribution coming. Instead, I would simply wait until any such future distribution goes ex dividend and then I will consider buying more shares. Large dividend distributions are not in my interest. I have to pay taxes on those distributions and the share price is adjusted down by the amount of the distribution. I do not have more money after one, but less. They can work out long term only when I reinvest the dividend and the shares bought with the dividend generate a total return after tax greater than the tax that I had to pay when that dividend was paid. That can happen in a long term secular bull market when the annualized total return for reinvested dividends could exceed 10%. When there is a long term secular bear market, the reinvested dividends are losing part of their original value. I will consequently pay a lot of attention to the total return after reinvestment of dividends when I am reinvesting the dividend, which is the case for CHN. I can find those total return numbers at a number of places, including the sponsor's website, Morningstar, and CEFConnect. I can also use the Dividend Reinvestment Calculator at longrundata.com. 3. Added to Matthews China Dividend Fund (MCDFX)(see Disclaimer): This fund is available on a NTF basis in all of my brokerage accounts. I reinvested a small year end distribution ($60.75) to buy additional shares, as noted in a snapshot found in the introduction section to a 12/13/14 Post. Description: The Matthews China Dividend Investor Fund (MCDFX) is currently rated 5 stars by Morningstar. Some of the dividend opportunities are in Taiwan, where the fund had a 16.7% weighting as of 6/30/14. The weighted average P/E ratio is low particularly compared to U.S. stock funds. 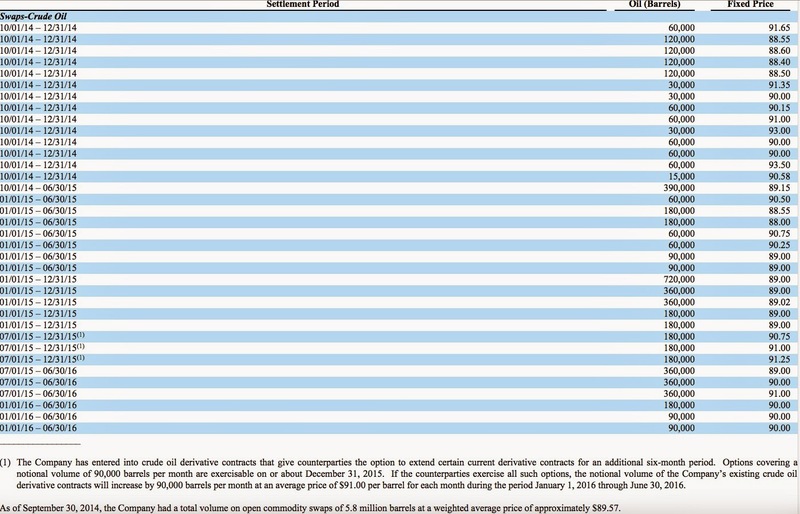 The last shareholder report is for the period ending 6/30/14: 2014SemiAnnualReport.pdf Data relating to the China Dividend Fund starts at page 22. The gross expense ratio is 1.24% which I view favorably for this kind of fund. I also pick up some exposure to China, Hong Kong and Taiwan through my long standing position in the Matthew Pacific Tiger Fund (MAPTX). Overview - Matthews Pacific Tiger Fund That fund is closed to most new investors. I have owned shares for more than 10 years. The 10 year annualized total return is 12.36% through 11/30/14. MasterCard reported that Christmas sales, excluding automotive sales, were up 5.5% form Black Friday through Christmas Eve. At the time of redemption, this bond was rated B3 by Moody's and B by S & P.
I am mentioning this dividend simply to show that there was no withholding tax but simply a $1 fee collected out of the dividend by the ADR custodian. It is my understanding that Australian will not collect a tax when the dividend is "fully franked" by the company. Shareholder Dividend - National Australia Bank; Australian Taxation Office; Australian taxation of dividends. The Mexico Equity and Income Fund went ex dividend last week for a $1.618 per share distribution that included a $1.42 per share long term capital gain distribution. I own 50 shares and will average down after this distribution. I will want a larger discount to net asset value then the -9.39% as of 12/26/14. The historical 5 year average was -11.18% as of 12/26/14. The closing "indicative value" on 12/26/14 was $46.02. Security Description: The J P Morgan Alerian MLP ETN (AMJ ), as indicated by its name, an exchange traded note (ETN) that tracks the Alerian MLP Index. I generally keep my exposure to ETNs limited, since that form of ownership exposes me to the issuer's credit risk, in addition to the numerous risks associated with the index being tracked by the ETN as well as other risks relating to this product. "Exchange-Traded Notes Avoid Unpleasant Surprises- FINRA; NYSE Publication: "What You Should Know about Exchange Traded Notes.pdf. ETN's are unsecured senior notes. I am reasonably comfortable with the JPM credit risk, so I will buy 50 shares and will occasionally harvest profits as noted below. I would simply explain the credit risk as follows. If JPM went bankrupt, the owners of AMJ are screwed. The investors who owned Lehman unsecured senior notes found out the hard way about the value of those notes in a bankruptcy. The sponsor, J P Morgan, quit creating shares in this ETN back in 2012, and consequently this ETN has taken on some of the characteristics of a closed end fund. The AMJ senior unsecured note matures on 5/24/24. The ETN structure has a complicated issue relating to the sponsor's redemption of the note. The calculation is difficult to comprehend and is explained starting at page PS-8 of the Prospectus. To deal with this kind of issue, I will simply avoid owning this security on or 1/1/2020. I believe that this is the quote for the Alerian MLP VWAP Level Index which appears to be used in that calculation. The Initial VWAP Level is shown as 190.36605. Amendment No. 11 to Pricing Supplement No. 152 I also read that the principal amount of the note is Initial VWAP Level dividend by 10 or just over $19. This ETN does not own any of the securities that are components of the index. The Sponsor's website did not have an updated list of the index's components, and still had KMP as a member of the Alerian MLP Index. The sponsor's website was deficient in other respects as well, including no reference to the recent distribution payment in the distribution history as well as omitting some other prior historical dividends. I give JPM an "F" for its poor AMJ website. Kinder Energy Partners, which formerly traded under the symbol KMP, did have close to a 10% weighting in that index when I last bought some AMJ shares. KMP is no longer a component after being acquired by Kinder Morgan, Inc. (KMI). I consequently went to the Alerian website and downloaded the current components and their weightings as of 12/19/2014. 8.53% ETP $63.69 -0.26 (-0.41%): Energy Transfer Partners L.P.
7.88% MMP $85.11 -0.63 (-0.73%): Magellan Midstream Partners L.P.
7.65% PAA $51.52 -0.14 (-0.27%): Plains All American Pipeline L.P.
5.23% MWE $66.62 +0.22 (+0.33%): MarkWest Energy Partners L.P.
As of 12/26/14, Morningstar has a 3 star rating on AMJ and calculates the 3 year standard deviation at 14.13. With both MLP ETN and ETFs, I can avoid the K-1 hassle. Since I prepare my own tax returns, I am going to avoid the tax preparation issues connected with owning MLPs directly, which involves imputing K-1 data into my tax return. I have been there and done that. When and if I ever decide to hire a CPA, I will start owning them directly again. AMJ Distributions: The distributions are paid quarterly at a variable rate that is linked to the distributions paid by the MLPs in the index less accrued tracking fees. The tracking fee is high at .85%. The dividends will be taxed at ordinary income rates so I bought this last lot in the Roth IRA where I effectively turn the distributions into tax free income. In 2014, this security paid $2.3278 per share in distributions. AMJ Dividend Date & History The total distribution for 2013 was $2.1887. The Y-O-Y distribution increase was 6.355%. If I assumed a 6.3% increase in 2015 over the $2.3278 rate for 2014, the total distribution would be about $2.474. Assuming further a total cost per share of $45.95, the dividend yield would then be about 5.38%. Rationale: Given the dividend yield, I can achieve a 10+% total return with about a 4.6% in rise in the share price after commission next year, assuming a 6.3% distribution increase, and less with distribution increases in the out years. Many of the infrastructure MLPs have a history of steadily rising distributions. (1) Income May be Devoured by a Loss on the Shares: MLPs have been volatile recently with a downside bias. The downside pressure has coincided with the precipitous decline in crude oil prices. AMJ closed at $53.83 on 9/19/14, declined to a $45.72 closing price on 10/14, shot back up to $52.4 on 11/20 and then hit another air pocket with a spike down to $42.11 (12/15) before recovering some to the date of my purchase. Peak to valley over about a 3 month period was about a 21.77% variance. My purchase price of $45.95 represented a 14.64% decline from the 9/19/14 closing price. AMJ's volatility in price indicates to me that investors have become more uncomfortable with MLPs, most likely due to the unsettling decline in crude oil prices. It does not take much of a price correction to wipe out a 5% yield. Hopefully, the recent volatility will simmer down, as investors realize that most of these MLPs are not directly exposed to energy prices and will consequently focus more on the long term benefits associated with the infrastructure MLPs including rising payouts. Part of the distribution has been offset by price depreciation YTD through 12/26/14. Morningstar calculates the YTD total return number at +3.25. The annualized total return over 5 years through 12/26/14 was 15.34%. (2) JPM Default Risk: I would just note that this risk does exist, even though it is remote based on what we know now. (3) Risks Associated with the Securities in the Alerian MLP Index: There are risks associated with the securities tracked by the index that are discussed in the prospectus. There may be added risks coming from Congress in future years due to changes in the tax code as the government attempts to raise more money. (5) Increasing Correlation with Crude Oil: Over the past ten years, energy infrastructure MLPs have had a .38 correlation with crude oil prices, as noted by the Oppenheimer Funds' Director of Research. Since 2010, however, there have been 5 periods when WTI crude declined more than 15%, with an average 22% decline, and the Alerian MLP index has declined by more than 11% on each such occasion. Some MLPs in that index have more exposure to crude oil and natural gas prices including the E & P MLPs and those with commodity exposed gathering and processing. Cohen and Steers MLP Strategy November 2014 Other companies, including the pipelines, have more of a fee based cash flows under long term contracts. While CBRE and JPM are expressing my understanding of the commodity exposure outside of the E & P MLP sector, the market has increasingly sold off MLP infrastructure companies during crude oil declines. If this proves to be a irrational correlation based on future MLP earnings reports, then the market will hopefully revisit the wisdom of the MLP infrastructure selloff. (6) Note Valuation at Maturity: As I mentioned above, the maturity value of this note will be difficult for most individual investors to calculate. Trying to understand the calculation caused my head to hurt so I just quit trying to figure it out. (8) Non-Temporary Rise in Interest Rates: A rise in interest rates will increase borrowing costs for MLPs and increase the competitiveness of other income investments that lack the tax preparation issues involved with direct ownership. Last year, the ten year treasury rose from a 1.66% yield (5/1) to 3.04% (12/31/13). Daily Treasury Yield Curve Rates Unadjusted for distribution payments during that same period, AMJ held up well in that period, closing at $46.35 on 12/31/13, up slightly from a closing price of $45.98 on 5/1/13. A more permanent rise to normal historical levels for the ten year treasury and other income generating securities competing for investors' dollars may have a significant adverse impact on MLP unit prices. I can only speak for myself on the yield competition issue. I would have significantly less exposure to risk categories with a ten year treasury at 4% or higher. The rise in rates last year was from an extremely low level to a less abnormally low level. Snapshot of Profit and Total Return: This trade was slightly better than break-even. Rationale: I am substituting AMJ for KKR in the Roth IRA after AMJ's recent price correction. With AMJ, I am picking up diversification and a less erratic dividend distribution. I was also concerned about KKR after reading this article in the WSJ earlier this month about a large investment in an E & P company: WSJ That article just raised my already existing discomfort level. For the reasons discussed in a March 2014 post, I started a tactical allocation shift into REIT common and preferred stocks starting in September 2013. Equity REIT Common and Preferred Stock Table as of 3/5/14 This particular shift started after prices had significantly corrected in the May to September 2013 time frame. Most of my best buys were made in December 2013 that marked the high point in the correction process. I viewed the 2013 correction to have two primary causes. Aggregate P/FFO data can be found in Lazard's monthly Real Estate Report. The aggregate P/FFO has become somewhat elevated again. Canadian REITs are undervalued compared to U.S. REITs based on P/FFO or P/AFFO and dividend yields. Many of the Canadian REITs have recently hit 52 week and/or all time lows. The latest downdraft in prices was concurrent with the abrupt decline in crude oil prices, as I have noted in recent posts discussing adds to my Canadian REIT positions. I currently have a total realized gain of $3,107.79 (snapshots at Gateway Post: Equity REIT Common and Preferred Stock Basket) In my next update, I will have the 2014 dividend total for this basket. Profits from Canadian REIT sells are reported here in USDs, which is the 1099 tax reporting requirement even though I am using CADs to buy and receiving CADs when I sell. So far, my CAD profit from those sales have been higher. The decline in the CAD vs. the USD results in a lower reported taxable profit. I am not tracking reinvested dividend in the following table. I have a few problems in this basket. The unrealized losses on my Canadian REITs would more than offset my realized gains this year. Most have 9%+ yields at their current prices or slightly under that level. ARCP proved to be a mistake due to the accounting fraud that occurred after my purchase. The Toronto stock exchange was closed today, so the quotes for the Canadian REITs are from last Wednesday. I have published several articles at SA discussing REIT purchases that are basically reprints of my my posts here, except for the introduction section in those articles. The government estimated that real GDP grew at a 5% annualized rate in the third quarter, up from its second estimate of 3.9%. News Release: Gross Domestic Product Real personal consumption expenditures increased by 3.2%. Durable goods increased by 9.2%. Stephen Roach believes that the Federal Reserve is leading the U.S. into another catastrophe with its abnormal monetary policies. There is a tribe of economists who believe that the abnormally low short term rates manufactured by central banks around the world is actually contributing to deflationary forces. They call themselves Neo-Fisherites. Fisher Effect; Theories of Inflation. Since I was unwilling to buy more than 1 bond, I had to pay a price that was about $60 over a per bond price for a 10 bond offer. I am more worried about Petroquest surviving to pay off the bond in 2017 than that $60. Security and Company Description: PetroQuest Energy (PQ) is an independent oil and gas company with operations in Oklahoma, Texas and the Gulf Coast Basin. In 2010, the 2017 senior unsecured notes were issued in the principal amount of $150M. The company later sold another $200M that was used to purchase assets in the Gulf of Mexico shallow waters, including 16 gross wells located on 7 platforms. The confirmation excerpt shows that my current yield is 10.818% and the yield to maturity is 13.435%. The bond is rated Caa1 by Moody's and B by S & P.
An optional redemption is not going to happen anytime soon. PQ can not refinance this bond at a lower rate. It would have to pay a higher coupon now based on the market's pricing of this 10% coupon bond. There is a "change of control" provision in the prospectus that requires the repurchase of this bond at 101% plus accrued interest in accordance with its terms, see pages S-43 to S-46. If PQ was acquired by a Chevron or Exxon, the change of control provision would not matter. Both of those companies would exercise the optional redemption right. The change of control provision would be relevant when the acquiring company was not investment grade, particularly when the bond was selling at a discount to par value prior to the acquisition announcement and/or would not likely be called early due to the credit quality of the acquirer. The risk is obvious. The risk of default is high under the current circumstances. It was not viewed as high by the market before crude oil collapsed in price. The FINRA page for this bond has a chart of its price history. For most of the period since its original issuance in 2010, this bond was trading over 104 and traded over 107 as recently as May 21, 2014. Starting in October 2014, the bond just cratered in price in response to OPEC's decision to maintain production. The hedge book will help for awhile. It does not solve the liquidity concerns that will result from a prolonged period of relatively low crude and natural gas prices. The current price of this bond and the common stock reflect a current market consensus that this company has a dangerous road ahead of it. Future Buys/Sells: In my extreme high risk category for junk bonds, I will buy no more than 1 bond at a discount to par value. If I am unable to buy 1, I will not buy any. I have no idea now for how long I will hold this bond. If crude remains weak into the summer, I may be looking for an exit. I did a currency conversion based on the ordinary shares priced in Swedish Krona. The shares closed at SEK90.6, but were trading slightly lower when I made my purchase. I set my limit price slightly below the then existing USD equivalent for the ordinary shares priced in SEKs. Company Description: Nordea Bank is the largest financial services group in Northern Europe operating through approximately 800 branches primarily in Denmark, Finland, Norway, and Sweden. Some branches are in Russia, the three Baltic countries. Earnings per share, ex items, increased to €.30 from €.19 in the 2013 third quarter and to €.68 from €.58 for the ninth month period ending 9/30/14. The capital ratios are good in my opinion. The Nordea efficiency ratio, defined as costs to income excluding extraordinary items, is shown at 49%. That would be significantly lower than big U.S. banks and consequently much better. Dividends: The current dividend policy is to pay out more than 40% of the net profit for each year. That policy will result in some variation in the dividend rate. The dividend is paid annually. The last ex dividend date was March 21, 2014. The dividend paid in 2014 was for 2013 and amounted to SEK3.84, up from SEK2.93 for 2012 and SEK2.32 for 2011. Dividend | Nordea.com There was a lower than normal payout ratio in 2008 with a SEK2.17 dividend, down from SEK4.7 for 2007. The dividend for the ADR will depend on the exchange rate at the time of conversion. If the dividend for 2014 was SEK4, and that amount was converted at the same exchange rate as prevailing on 12/23/14, the USD equivalent would be about $.5135 per ADR share or a 4.44% dividend yield at a total cost of $11.56 per share. I can not compute the dividend yield until Nordea declares the dividend for 2015 early next year and then I would need to have the conversion rate too. If I went to a high point in the SEKs value against the USD, say April 26, 2011, 4SEKs would be worth about $.6563 and then the dividend yield would be higher at about 5.68%. If I took the exchange rate for 5/25/10, which looks like the low point over the past 5 years just eyeballing the five year chart, a 4SEK per share dividend payment would buy $.505, which would be a slight dividend cut through currency exchange from the exchange rate on 12/23/14. I go through this exercise to demonstrate that the price of the ADR and the value of the dividend are both impacted by the currency exchange factor. Rationale and Risks: Nordea appears to me, sitting at a desk in Tennessee, to be one of the best European banks, probably the best large bank in Europe. 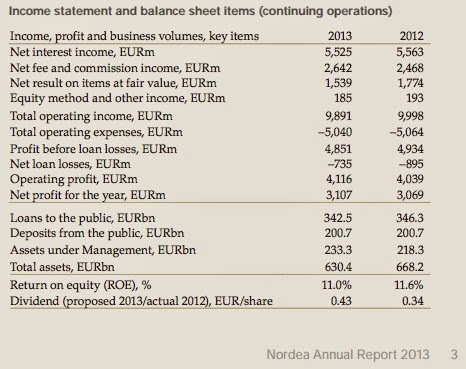 Notwithstanding stagnation in its primary markets, Nordea is still generating good numbers. There is also decent dividend support and the valuation is reasonable at slightly over 11 times 2014 estimated earnings. Economic conditions in Nordea's home markets are stagnating. It remains to be seen whether those Nordic countries will tip over into recessionary conditions. Economic downturns are unfavorable for banks which is an obvious point. The currency conversion issue has been a major negative recently for owners of the Nordea ADR priced in USDs as reflected in the chart below. Comparison Chart: This is a one year comparison chart featuring the ordinary shares priced in SEKs (blue line) and the ADR priced in USDs (brown line). When looking at this chart, I see a significant price divergence, starting in the 2014 summer, that would be caused by the SEK losing value against the USD. The USD may continue its parabolic upside move which would be bad news for me now as an owner of NRBAY. An investor needs to understand the currency risk thoroughly before an intelligent decision can be made on whether to accept or reject that risk. The risk can be a benefit too when the SEK rises in value against the USD after my purchase. If the SEK gains in value at the same time as a rise in the ordinary shares price in SEKs, then an owner of NRBAY will outperform the owner of the ordinary shares priced in SEKs. The worst possible scenario, the infamous double whammy, is a continued decline in the foreign currency occurring with a decline in the ordinary shares priced in SEKs. Yikes. I am receiving way too many large year end dividend distributions. I just received a $6.2318 per share dividend in cash from the mutual fund SSgA Emerging Markets Fund; (SSEMX). I only own 100 shares and consequently received a cash distribution of $623.18 on that small position. I had an unrealized profit on the shares and now I have an unrealized loss and a tax obligation. I am worse off. I have a tax obligation that decreases my net worth and this mutual fund's price is adjusted down by the amount of the dividend per share. These large distributions are pushing up my tax 2014 obligation beyond my previous estimates. Consequently, I decided to harvest some tax losses to offset in part those gains. I sold out of the closed end foreign bond funds FAM and SGL, but only in my taxable accounts. My total share loss on those two positions was $1,181 but I would guess that the total loss adjusted for dividends paid and received would be close to $600. Those two funds are performed poorly this year due to the parabolic rise in the USD against foreign currencies and exposure to less than desirable sovereign bonds that have been hit hard by the crude oil plunge (e.g. Venezuela). I will consider buying back some FAM shares at lower prices next year, after waiting the required period to avoid a wash sale. I am going to start adding some junior E & P names in my LT basket. Someone mentioned that a better option would be to take a whip and give myself a few lashes on the back. That sector does qualify for the deep value contrarian, falling knife and smashed stock prices that are the sine qua non of the Lottery Ticket basket strategy. I will summarize the purchases when and if I also buy a bond or when I update the LT basket which will be several weeks from now. 1. Averaged Down: Bought 50 GSPRC at $19.63 (see Disclaimer): My prior purchase was at $19.95, so this is an insignificant price change for an average down. Security Description: The Goldman Sachs Group Preferred Series C (GS.PC) is an equity preferred stock issued by the Goldman Sachs Group Inc. (GS) that pays non-cumulative and qualified dividends at the greater of 4% or .75% above the 3 month Libor rate on a $25 par value. This security will be senior only to common stock. The minimum coupon provides a measure of deflation/low inflation protection while the spread to the 3 month Libor rate addresses the problematic inflation scenario. This security falls under my classification of floating rate equity preferred stocks. I discuss their advantages and many disadvantages in this Gateway Post: Stocks, Bonds & Politics: Advantages and Disadvantages of Equity Preferred Floating Rate Securities That post also contains snapshots of my profits and losses greater than $30. The current total net profit stands at $11,752.05. My largest unrealized gain is in SANPRB, an equity preferred floating rate stock issued by Santander Finance that pays the greater of 4% or .52 above the 3 month Libor rate. An increase in the GSPRC coupon above the 4% minimum will not occur until the 3 month Libor rate exceeds 3.25% during the relevant computation period. It would not be reasonable at this time to predict a coupon increase for several years. That probability is one disadvantage for this security compared to a fixed rate coupon from the same issuer. Comparison to a Fixed Coupon GS Preferred Stock: For example, Goldman Sachs does have a 6.2% fixed coupon preferred that is functionally equivalent with GSPRC except for the coupon. GSPRB Prospectus Both are non-cumulative, potentially perpetual equity preferred stocks with $25 par values, and are in pari passu with one another in the capital structure. The Goldman Sachs Group Inc. Series B preferred stock closed at $25.1 on 12/19/14, which gave that security about a 6.17% current yield, slightly below the coupon amount due to the premium price above the $25 par value. GSPRC closed at $19.53 on 12/19/14, which is equivalent to about a 5.12%. In both calculations, I am not factoring in the impact of a brokerage commission. The investor has to accept a slightly lower yield now in exchange for the interest rate and inflation protection contained in the float provision. 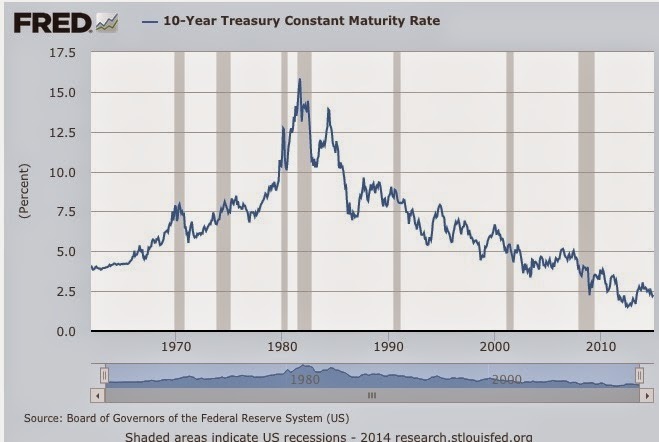 That differential in current yields, which was about 1.05%, is similar to an insurance policy. The investor is in effect paying a current price for a type of insurance against an unexpected rise in short term rates caused by a FED response to problematic increases in both current and anticipated inflation. Unlike the fixed rate coupon, the floater will increase the coupon rate after the float provision is activated by a sufficient increase in the 3 month Libor rate. Just for illustration purposes, I am assuming that the 3 month Libor rate was 6% during the relevant computation period. With the .75% spread, the coupon would become 6.75%, higher than the 6.25% of the fixed rate preferred GSPRB. More importantly, the yield at a constant total cost per share of $19.53 would increase to 8.64%. 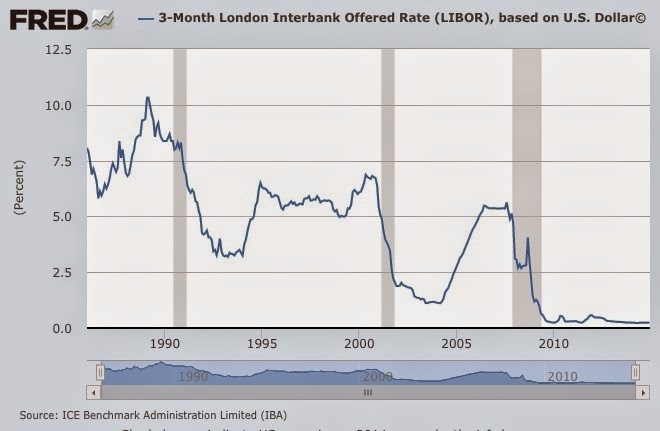 At a 4% 3 month Libor rate, the yield would increase from 5.12% to 6.08%. There is one other pure fixed coupon preferred, GSPRL, which has a 5.95% fixed rate coupon. There are currently 3 fixed-to-floating rate GS preferred stocks. I view that type of security as a gimmick. I discuss my reasoning in Item # 1 Bought 100 VRP at $24.89. 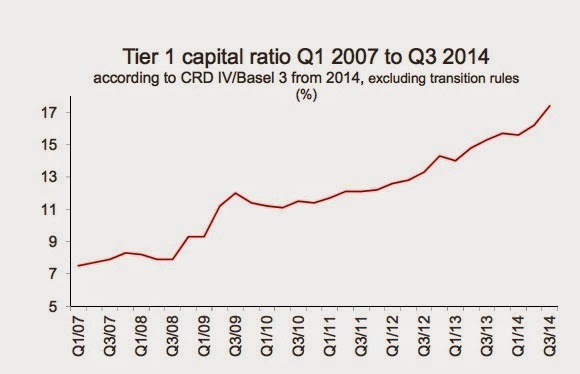 As the Libor increases over 4.07%, the differential in favor of GSPRC will increase. Stopper Clause: The stopper clause is the legal mechanism that assures the preferred stock owner that their dividend will be paid in full for as long as a cash dividend is paid on the common shares. As soon as that common share cash dividend is eliminated, however, there is no remaining legal impediment to prevent the elimination of the non-cumulative preferred dividend. The prospectus does contain a standard "stopper" provision that would prevent Goldman Sachs from paying a cash dividend to the common shareholders and eliminating its non-cumulative preferred stock dividends. (see pages S-12 to S-13). Once the common dividend is eliminated, there would be nothing legally that could stop GS from eliminating the GSPRC dividend. However, as a practical matter, it would be unwise for Goldman Sachs to eliminate the preferred stock dividends to preserve capital. If you were an institutional client, what kind of message would such an elimination send to you? For an investment bank, dependent on customer confidence in its financial viability, the only practical course would be to pay the preferred stock dividend until the company does a Lehman Brothers. A failure to pay prior to a bankruptcy filing could easily cause that result. Related Preferred Stock Trades: I currently own 150 GSPRD, a functionally equivalent floating rate preferred stock. Snapshots of gains from trading GS floating rate preferred stocks can be found in the Gateway post for this topic. The largest realized gain to date was just $257.24 from a 100 share lot of GSPRD. The other gains have been in the $40 to $100 range. Until I have a better feel as to the timing of a coupon increase, I am in a trading mode for the equity preferred floaters except for my SANPRB shares due to their low cost basis. Rationale: The main advantages of this type of security are as follows: (1) the security pays qualified dividends and (2) provides a measure of deflation/low inflation and problematic inflation in the same security. The deflation/low inflation scenario is addressed by the minimum coupon, while the protection for problematic inflation involves the LIBOR float activation. By buying at a discount to par value, I juice the yield in both scenarios. At a total cost of $19.63, the minimum yield will be about 5.01%. There is no maximum coupon. If the coupon becomes too high for GS due an increase in the LIBOR rate, then the security can be called at the $25 par value, which will generate a decent percentage profit, plus the accrued dividend at the time of any such redemption. The discount to par value has a built in profit potential when and if a scenario arises that would cause GS to redeem at par value. That potential does not exist with the fixed coupon preferred GSPRB which is currently selling at a premium to par value. I currently have no concerns about GS paying the preferred stock dividend. It is paying a common stock dividend which would have to be eliminated before GS could eliminate its non-cumulative preferred stock dividends. (1) Highly Volatile/Heightened Risk/Non-Cumulative: I started to invest in some of these securities during the Near Depression when they could be purchased at greater than 50% discounts to their $25 par values. The downside risk is zero as shown by what happened to those unfortunate souls who owned LEHPRG, a Lehman equity preferred floater, that is now worthless of course. An equity preferred stock is only superior to common stock. It will be junior in the capital structure to all bonds. Given that low priority, the non-cumulative dividends paid by many of them, and the highly leveraged balance sheets of financial institutions issuing them, there will be no recovery in a bankruptcy for an owner of an equity preferred stock. Investors realize that would be the likely outcome and will behave irrationally when there is a whiff of a possible financial collapse. (a 75% chance of bankruptcy priced into the preferred stock when a rational number would be less than 10%). BAC equity preferred stocks, for example, could have been bought for less than $10 even in 2009. I bought ZBPRA, a Zions equity preferred floater for $7.8. None of those equity preferred floaters missed a dividend payment. In the October 2008 to March 2009 period, GSPRC pierced at times the $10 price level. GS.PC Stock Chart A long term chart highlights the risk. Over the past two years, this preferred stock has traded mostly in the $20 to $24 range, with occasional breaks to $18 and crosses over $24. The last rally over $24 peaked at $24.97 in May 2013. Periodically, these stocks will hit an air pocket and just fall as if a bankruptcy filing was imminent. I am just use to it. The low coupon floating rate preferred stocks declined broadly when interest rates rose starting in May 2013. Short term rates remained anchored near zero and inflation expectations were trending down. Under those circumstances, the was no anticipation of a coupon increase and other credit instruments become more competitive in their yields. 2. No Coupon Bump Likely for Several Years: The likely continuation of ZIRP into 2015, and the probable slow pace of the subsequent tightening cycle after ZIRP's end, will combine to keep the 4% minimum coupon as the applicable rate for several years. It would take a rise in the 3 month LIBOR rate to over 3.25% during the relevant computation period to trigger any increase in the coupon. I do not currently see that happening before 2017. However, investors may be too sanguine now about future inflation prospects. 3. Zero Value in a Bankruptcy: If GS goes bankrupt, I will not be asking anyone why my equity preferred stocks are now worthless pieces of paper. Future Buys and Sells: Most likely, I am full owning 250 shares of a GS preferred stock. If I get a pop in either GSPRC or GSPRD, I will consider lightening up some. The price shown in the confirmation includes the $8 Fidelity commission. NOG owns a minority interest in wells in a large number of wells. In 2013, NOG participated in the drilling of 531 gross (40 net) wells in the Williston Basin. 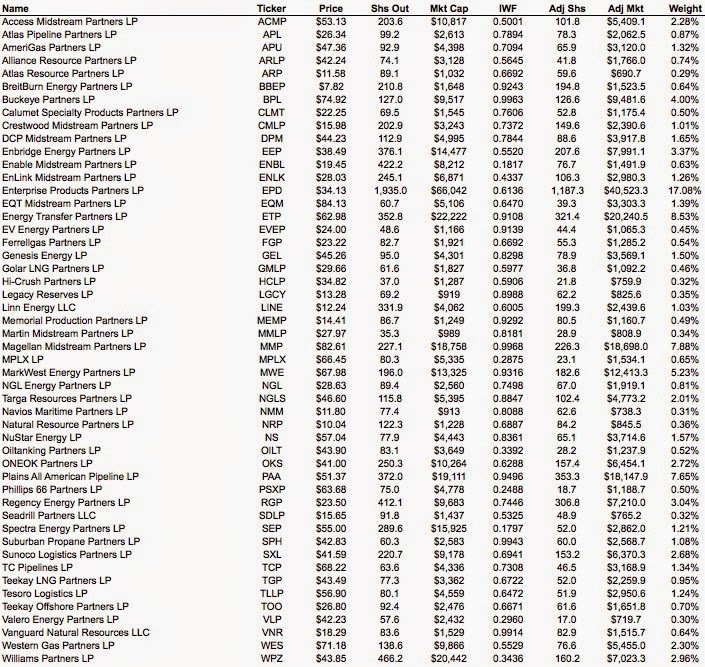 The company owned working interests in 1,758 wells (146.2 net), as of 12/31/13. NOG uses a non-operator model which limits the ability to control the timing or allocation of capital spending. I would view that model as a disadvantage in the current operating environment. The confirmation excerpt, shown above, states that the current yield at my cost is 10.767% and the yield to maturity is 15.07%. The confirmation further notes that the bond was then rated at Caa1 by Moody's and B- by S & P.
The common stock chart shows duress and highlights risks: NOG Interactive Stock Chart The stock was smashed in 2008 when the WTI oil price plunged from over $140 to less than $40 over a brief period of time. The NOG shares went from $14 to slightly over $2 by March 2009 and then rallied to over $32 in February 2011, and then declined into a channel trade mostly between $20-$25 between May 2011 and April 2012. A lower channel developed thereafter between $12 and $16. The abrupt decline in crude prices in late summer caused the shares to crater to $5.16 earlier this month before recovering a tad. As of 9/30/14, NOG had drawn $228M on its secured credit facility. There was $508+M in the 8% senior unsecured notes outstanding. 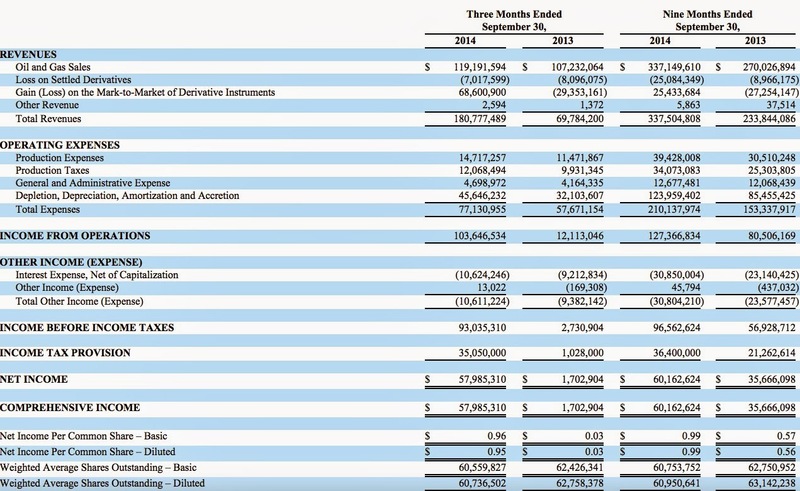 10-Q Q/E 9/30/14 NOG then had slightly over $8M in cash. Net production for the 2014 third quarter was 1.513+ million barrels of oil equivalent. Net production for the nine month period ending 9/30/14 was 4.11+M Boe. The third quarter's dollar value was heavily weighted in oil with $113.6M+M vs. natural gas at $5.5+M. At the quarter end, the company had an interest in 177.4 "net producing wells"
Recent Earnings Report: The last earnings report was good. 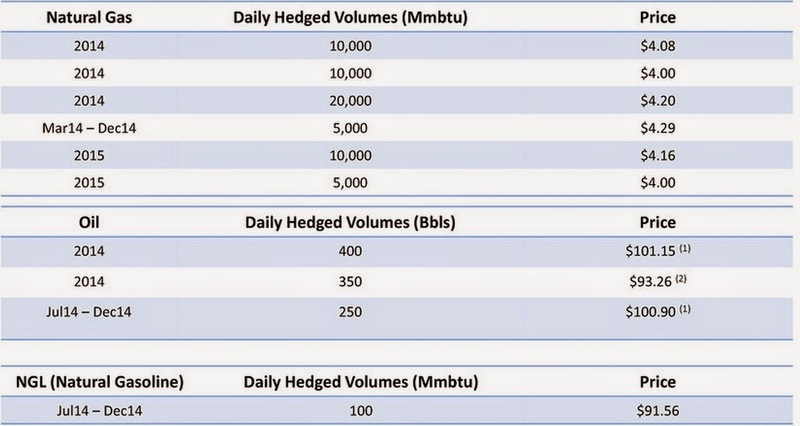 The 2015 hedging looks okay to me at 990,000 barrels per quarter at slightly over a weighted average cost of $89 per barrel. However, there is a lot of production that is unhedged. In the last quarter, the company had 1.348+M barrels of crude oil production. The problem is not the past but the near and intermediate term future. To finance spending, NOG has been devouring all of its cash flow and then borrowing funds to pay the balance under its secured senior credit facility. This aggressiveness may be salutary when WTI is over $90 a barrel, but is potentially dangerous now. A secured unsecured bond owner does not want to see a company increase draws under its secured credit facility, particularly when that draw comes close to 75% of the maximum. The credit facility can be revised down based on the estimated value of proved reserves that could result in a downward revision of credit capacity and could even require the borrower who was under the limit to pay down the outstanding amount to bring the borrowings back under the revised lower limit. Rationale and Risks: The rationale and risks are inextricably intertwined. I receive the yield because the risk of loss is high. A 73 price for an 8% bond maturing in 2020 reflects a market judgment that there is a significant default risk prior to maturity. Recognizing that risk, and balancing the return with it, I thought that it was a fair trade to assume the risk only up to a 2 bond purchase. This bond is scary to the Old Geezer, just not as scary as the Sandridge bond. 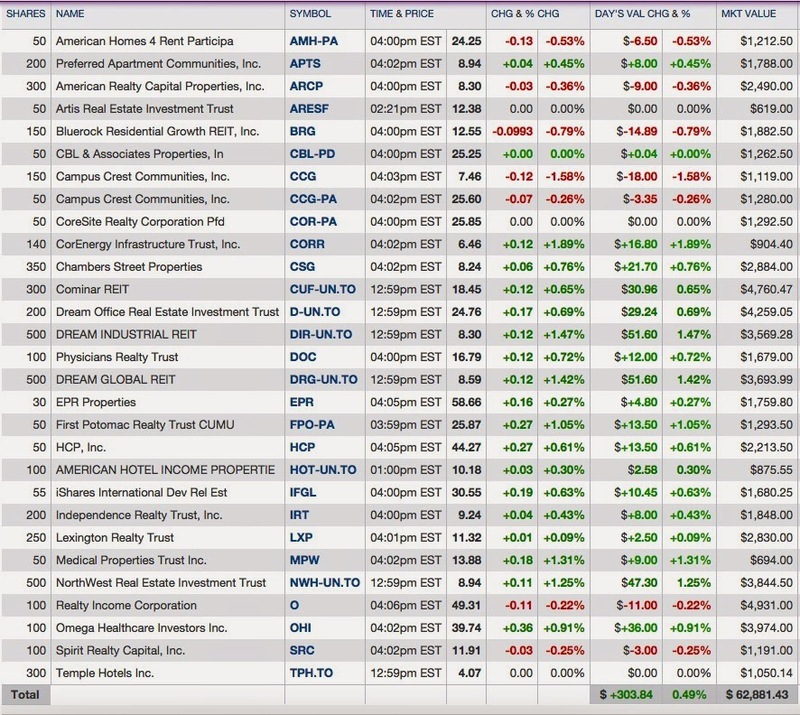 Future Buys and Sells: I have the common stock on my lottery ticket monitor list. I will not buy more NOG bonds. I have no firm plans about selling this 2 bond lot. If I become concerned that the WTI crude oil price will remain low for an extended period of time, I will consider selling this bond even at a loss. I will be inclined to hold it, possibly until maturity, with WTI holding steady above $80 per barrel. A 15.07% annualized total return to 6/1/2020 is highly likely to beat the SPY total return. The 15.07% total annualized return is locked with the usual caveat that Northern Oil has to survive to pay par value at maturity and to make all interest payments until that time. Can anyone give me the name of a stock that is likely to produce the same return? I plugged in a recent Apple stock price of $112 into a compound interest calculator and assumed a 15% annual compounded rate for 5 years. For ease of calculation, I did not factor in the dividend. 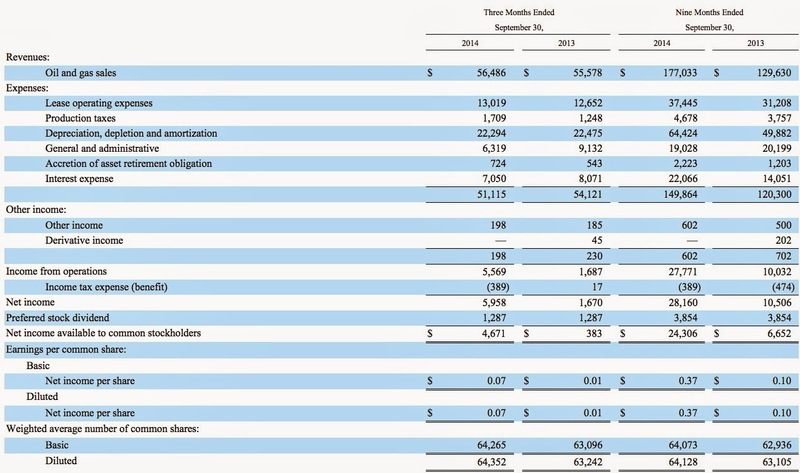 Apple's share price would be $225.27 with those assumptions. Money doubles in five years at a 15% annualized and compounded rate.